A piece of solid rope of some 12 feet in length is tied between two chairs. 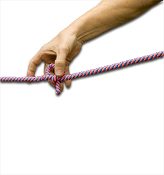 The rope is cut at ANY position designated by the audience. The two ends of rope are tied together and the knot is openly moved to ANY other freely chosen position... and it is untied there. The rope is cut at this spot! The effect can be repeated if so wished. In the end the rope is restored. Perfect addition to any rope routine!! !